As the weather cools down this time of year, I find myself drawn to the kitchen. There is something so cozy about a warm oven and the smell of baked goods in the air. For me, Autumn and baking go hand in hand. First on my Autumn baking list are these delicious Whole Wheat Cinnamon Apple Scones. This time of year, it is so easy to find crisp and juicy apples fresh from the orchards. When I found a box of Honey Crisp Apples at the market last week, I rushed home and went straight to the kitchen! Turning those Honey Crisp Apples into Scones was a total kitchen success. The sweet apples add juicy flavor and a slight crunch that make these scones irresistible. The trick to Scones that are tender and moist, rather than dry and crumbly, is in the butter. The best way to cut butter into flour is to take a frozen stick of butter and grate it using a box grater. Not only is it a quick way to get the job done, it also ensures that the cold bits of butter are more evenly distributed throughout the flour, keeping the Scones tender and moist. These Whole Wheat Apple Cinnamon Scones are not overly sweet, though they are full of flavor, and they make an excellent breakfast or midday snack. 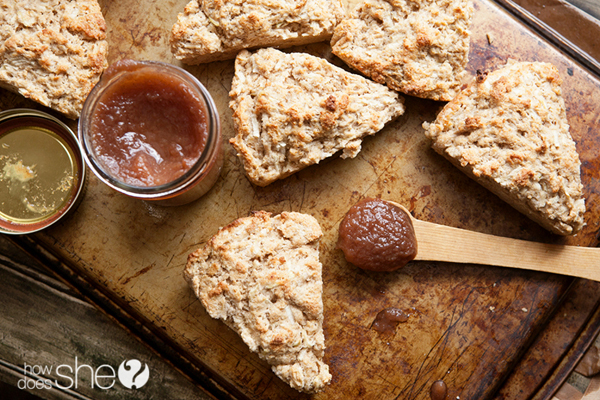 We’ve been enjoying them topped with Apple Butter, which pairs perfectly with the cinnamon apple flavors in the scone. They would also be delicious with jam, honey, or even just a small dab of butter. Preheat oven to 425. Line a large baking sheet with parchment paper. In a large bowl, whisk together flours and next 5 ingredients. Add grated butter and quickly mix to combine. Add apple, yogurt, egg, and vanilla and stir until just moist, being careful not to over mix. Turn dough out onto a lightly floured surface and knead lightly 3 or 4 times until well combined. Pat into a 7-inch circle about 3/4-inch thick. Use a sharp knife to cut into 8 triangles; place on prepared baking sheet, about 1 inch apart. Bake until golden, about 15 to 17 minutes. Cool for 10 minutes. 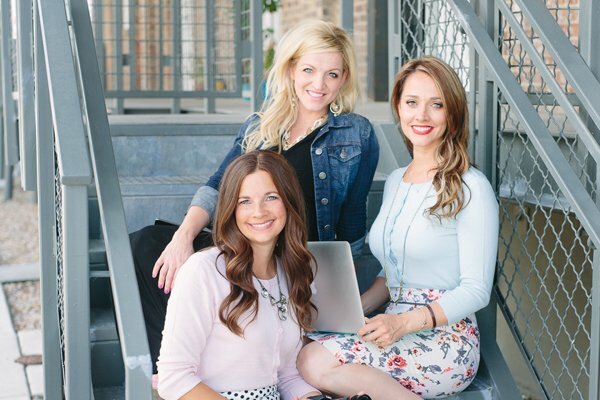 « Put your oxygen mask on first: 5 ways to recharge and love your life! Can I USE green apples Instead of Honey Crisp? Yes, green apples will be delicious. I have also used Gala Apples and they taste great too! Enjoy! Apple season is just starting here in New Hampshire. I’ll have all sorts of lovely, fresh apples to choose from. Would you suggest a firm baking apple such as a Cortland or a softer baking one like a Macintosh; what about a Macoun?